A professional engineer selling his hobby stuff. Excellent kit and some inspiring high quality work by Jussi. This kit went together well by following the directions. It takes some care, and a magnifying glass, but it worked right away. I've been having a lot of fun with it and created an interactive adaptation with LEDs under the cores that show the state of the cores. This makes it possible to "draw directly in memory" with a magnetic stylus. Just so you know, shipping can be quite slow to the US, and that's why I rated that 3 stars. Jussi was responsive and the product came through, but it took much longer than either of us anticipated. Overall, I'm very happy with the kit and appreciate the work Jussi put into it! Glad to hear you liked the kit. Not very glad about the shipping experience though; the only way I can affect it is by shipping promptly which I do unless there are stock issues. As you said, shipping to the US has occasionally been slower than promised by the carrier and there is nothing I can do about it because there are no cost effective alternatives. This DIY core-kit is great. The circuit is well designed and all the components are well to arranged on the print. The whole shield looks very nice. After soldering and loading the Arduino sketch the program works fine. I can read and write to the core's. 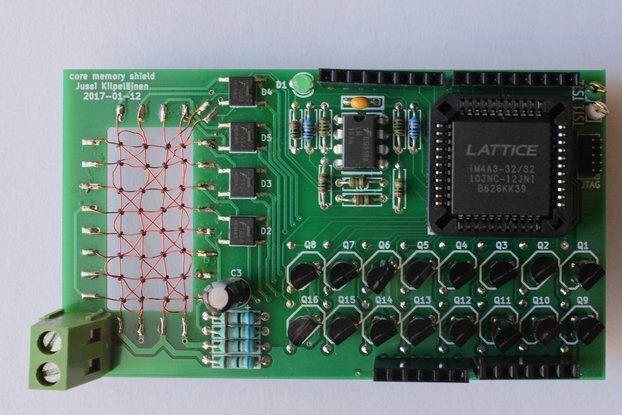 This shield is a very nice Retro-electronic's learning tool for me. Thank you for the review. I am glad you appreciate the looks - symmetry is something I aim for when designing PCBs. The kit and the documentation is excellent. Quality is very good, also good quality power connector and the PCB. The kit is quite easy to assembly and gives a lot of fun and ability to experiment with retro-technology. Also contact with the seller is very good. I totally recommend buying it! Thank you for the review Piotr. Fantastic kit, documentation and shipping! This kit was enjoyable to build, and threading cores was easier than I thought it would be. Took three and a half hours to finish. Only trouble I had was enamel coating on wire was troublesome to solder. It is fun to wave a magnet over memory. I would suggest running "t" test to ensure all bits are writing/reading properly. Thanks for the review Scott. The early kits (2016) used a type of magnet wire that needed to be removed with sandpaper. The newer kits ship with wire that is solderable. I have found out that heating the wire and then scraping it a bit works well. A fun kit where bits are literally weaved on strings. I made a video about this kit. It is a fun kit, and very unique. The arduino program gives you the tools needed to experiment with data storage. All you need is soldering tools, a flush cutter, fine pair of tweesers (I used plastic tweeser, or atleast non magnetized is a must), and an inexpensive Arduino UNO. Thank you for the review and the video. You are right in that I had forgotten to update some parts of the documentation to match the new board revision, and there were indeed a few mismatches between the schematic and the BOM. I just published the corrected document. Thanks again.